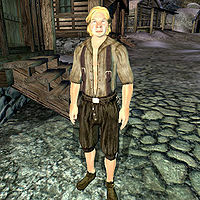 Regner is a Nord commoner who has recently moved to Bruma from the north with his wife, Edla Dark-Heart. While his wife spends most of her time practicing her archery skills and socializing with the citizens of Bruma, Regner prefers to sit in his chair outside the house, nagging to everybody who passes by. He sleeps in the basement area of his house every night between midnight and 6am. After waking up, he spends two hours on the ground floor before heading outside to his beloved chair. Once seated, he doesn't get up for twelve full hours and reenters the house as late as 8pm. He spends the last four hours of the day with Edla on the ground floor before going downstairs to his bed at midnight. Regner wears breeches, buckled shoes, and a shirt with suspenders. He carries his house key and a small sum of gold. His introduction makes it clear that his wife wears the trousers: "I'm Regner. You want anything? Talk to Edla. She's in charge." When asked about Bruma, he will reveal his hatred for the place: "I hate it here. Came here with Edla. All these snooty Southerners. And damn guards won't let anyone have any fun." For her part, Edla suggests that: "One place is pretty much like another. Regner hates it, but Regner hates everything." Due to him always sitting on his chair outside, he's noticed a thing or two about one of his neighbors, specifically Jearl, the main suspect during the quest Spies: "She's just back from a trip south, they say. Haven't seen hide nor hair of her myself though. Stays indoors all day long, I guess." Regner was supposed to have a two hour dinner in the Jerall View Inn at 6pm but his sitting package takes precedence. This page was last modified on 22 June 2018, at 04:32.